William Hope (1866-1936) was a famous British medium and paranormal researcher. He gained fame with his amazing “spirit photography,” a seemingly uncanny ability to capture the images of ghosts and spirits on camera. Although this technology is commonplace today (and, more often than not, known as “photoshopping”). Hope was the first man to produce these type of images. As such, his popularity as a medium exploded. Hope took many precautions with the plate cameras he used in order to rule out any possibility of fraud. However, this itself turned out to be a scam. In reality, the complicated rules he claimed to follow were little more than smoke and mirrors. Hope’s pictures were actually the product of skillful photo manipulation and advanced superimposing techniques. Still, although we can’t respect him as the herald of the supernatural world he liked to present himself as, we can at least give him a nod for his work as a pioneering photography artist. This photograph by William Hope is from the “spirit album”. A collection of hundreds of (fake) ghost pictures from the late 1800’s and early 1900’s. The woman’s face which appears above the couple was identified at the time as the sister of a man prominent in the Spiritualist Church. The signature in the upper left hand corner is by one of the sitters, to authenticate the plate. The couple are the parents of the person who compiled the spirit album. 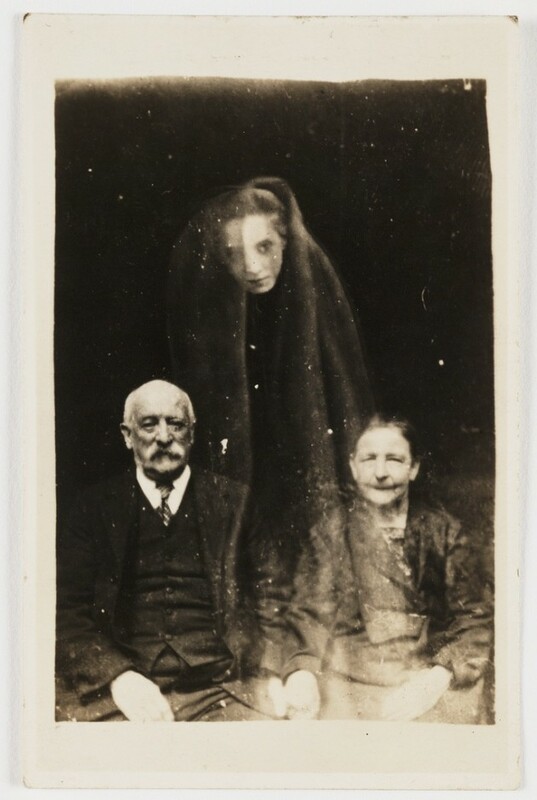 Hope’s spirit album photographs have been discovered to use multiple exposure techniques to render the appearance of ghostly apparitions. 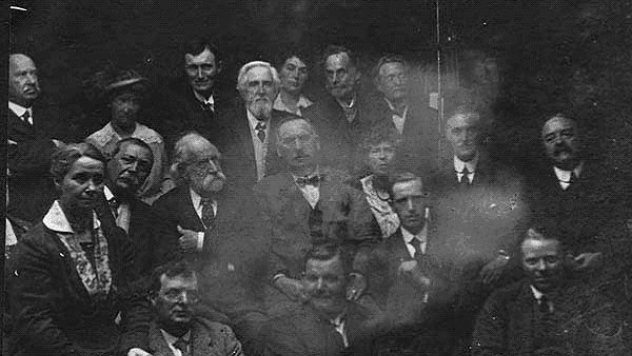 Hope went on to found the spiritualist society known as the Crewe Circle and his work, was in great demand after World War One when many bereaved people were desperate to find evidence of loved ones living beyond the grave. Although his deception was publicly exposed by a private investigator in 1922, he continued to practice.